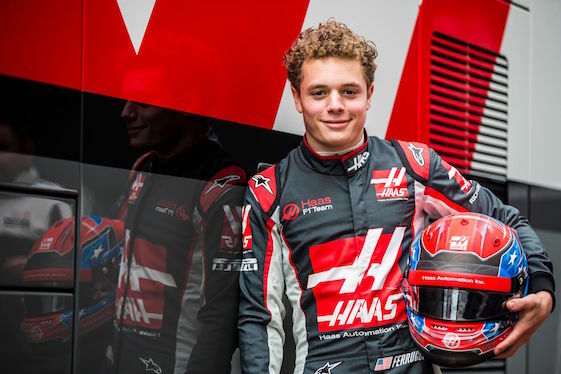 Santino Ferrucci took to the test track in the Haas F1 car this week. Haas F1 Team development driver Santino Ferrucci’s two days of Formula One testing saw the aspiring American come to grips with Pirelli’s Red supersoft tires … and the red blur that is Scuderia Ferrari’s Sebastian Vettel. Ferrucci completed his second and final day of testing in Haas F1’s current Ferrari-powered VF-17 chassis Wednesday by logging 116 laps around the 2.722-mile/4.381-kilometer/14-turn Hungaroring in Budapest, Hungary. Ferrucci ran his fastest lap of 1 minute, 20.994-seconds on a set of Pirelli P Zero Red supersoft tires. It was the 12th-quickest time among 13 drivers participating and Ferrucci’s best overall lap, having run solely on Yellow soft tires Tuesday with a best time of 1:21.185. The 19-year-old from Woodbury, Conn., tested for Haas F1 Team in the organization’s inaugural VF-16 chassis last July at England’s Silverstone Circuit. In doing so Ferrucci became the first American driver to wheel an American Formula One car since Oct. 9, 1977, when Danny Ongais drove a Penske PC4 in the Canadian Grand Prix at Mosport International Raceway in Bowmanville, Ontario. Formula One rules state that two days of each in-season test must be allocated to young-driver training, classified as someone who has competed in two or fewer grands prix. Haas F1 drivers Romain Grosjean of France and Kevin Magnussen of Denmark participated in the first open test April 18-19 at Bahrain International Circuit in Sakhir, making them ineligible for the second/final in-season test in Hungary. Ferrucci, meanwhile, made his debut in the FIA Formula 2 Championship last weekend in Hungary with Team Trident. In his first drive of an F2 car, Ferrucci qualified 0.408-seconds off the pole in 10th before earning points with a credible ninth-place finish in his first race on Saturday. Ferrucci graduated to F2 after spending the 2016 season and the first six races of 2017 in the GP3 Series with DAMS. Haas F1’s 57-lap Wednesday morning program consisted of ongoing setup work, running exclusively on Pirelli’s Yellow soft compound after an installation tour on White medium tires. Three new sets of softs were utilized among eight runs with Ferrucci setting his quickest time of the morning _ 1:21.235 on his 21st lap _ during his first timed stint on fresh rubber. The afternoon session allowed Ferrucci to sample Pirelli’s grippy/faster Red supersoft tires with three new sets at his disposal. With fresh tires bolted on each time for a pair of seven-lap runs and a five-lap stint, Ferrucci lowered his morning time to secure his quick lap of 1:20.994. He concluded the team’s program by recycling two sets of supersofts followed by runs on two sets of softs. Ferrucci recorded 116 laps Wednesday, bringing his two-day total to 218 laps or 593.445 miles/955.058 kilometers. Quickest on the final day was Vettel at 1:17.124. Williams driver Luca Ghiotto ran the most laps (161). The FIA Formula One World Championship has entered its summer shutdown before returning to action Aug. 25-27 for the Belgian Grand Prix at Circuit de Spa-Francorchamps. Last Sunday’s 70-lap F1 Hungarian Grand Prix saw Magnussen and Grosjean finish 13th and 19th, respectively, in the 11th round of the 20-race schedule. Vettel won for the Scuderia from pole position, leading all 70 laps to secure his 46th career Formula One victory, his fourth of the season and his second at the Hungaroring. The victory also gave Vettel breathing room in the world championship. Vettel came into Hungary with only a one-point lead over his arch-rival, three-time World Driving Champion Lewis Hamilton of Mercedes AMG, but left with a 14-point advantage. Still, nine races remain. Haas F1 Team stands seventh in the constructors standings with 29 points, three ahead of eighth-place Renault and 10 points behind sixth-place Toro Rosso. Grosjean and Magnussen stayed 13th and 14th, respectively, in the championship driver standings. Grosjean has 18 points and Magnussen has 11. The FIA Formula 2 Championship also will be a part of the F1 weekend in Belgium, with a pair of races Aug. 26-27. Ferrucci will compete in both F2 races for Team Trident, and when not in the F2 paddock, he will be embedded with Haas F1 Team during practice, qualifying and the race. “Santino continues to progress in his racing career and we’re happy to provide another opportunity to aid in his development and the development of our race car,” said Guenther Steiner, team principal, Haas F1 Team. All 10 teams competing in the 2017 World Championship were present Tuesday. Ferrucci was the first driver out on the circuit when the track went green. He began with stock reconnaissance runs starting with a double installation lap on Pirelli P Zero White medium tires followed by two timed stints on the same compound for 10 laps and nine laps, respectively. Halfway through the session, Ferrucci switched to Yellow soft tires, logging 33 laps across three new sets before a break. Ferrucci’s best mark during the morning session was a 1:21.654 earned on his 44th lap. Ferrucci ran exclusively on soft tires in the afternoon, recording 47 laps with a program blending runs on used and new tires. Two short stints on used tires were followed by two eight-lap runs on fresh tires. It was on the latter of the stints where Ferrucci set his quickest time of the day, a 1:21.185 on his 80th lap that placed him 10th among the 12 drivers participating. Ferrucci closed the day with three further tours on used softs to raise his final lap tally to 102. Scuderia Ferrari test driver Charles Leclerc set the quickest time (1:17.746) with Mercedes AMG’s Valtteri Bottas recording the most laps (155). After scoring multiple karting championships, Ferrucci graduated to open-wheel racing in 2013, competing in Formula 2000 and the Skip Barber Racing Series. He won his Skip Barber Racing Series debut at Homestead-Miami Speedway and collected five victories, two poles and three fastest-lap awards. In Formula 2000, Ferrucci never finished outside of the top-four in the six races he started, with each field featuring 37 or more cars. The 2014 season saw Ferrucci in British Formula 3. He won two races, both at Brands Hatch, becoming the youngest race-winner in the history of British Formula 3 at 16 years, 2 months and 30 days. Ferrucci’s rise up the racing ladder continued in 2016 during his first season with DAMS, highlighted by a third-place finish Aug. 27 at Spa-Francorchamps. He also made his sports car debut, winning his first outing in the Lamborghini Blancpain Super Trofeo North America race Sept. 15 at Circuit of The Americas in Austin, Texas. Haas F1 Team made its debut in the FIA Formula One World Championship in 2016, becoming the first American F1 team since 1986. Founded by industrialist Gene Haas, Haas F1 Team is based at the same Kannapolis, N.C., campus as his championship-winning NASCAR Cup Series organization, Stewart-Haas Racing. Haas is the founder of Haas Automation, the largest CNC machine tool-builder in North America, and chairman of Haas F1 Team.